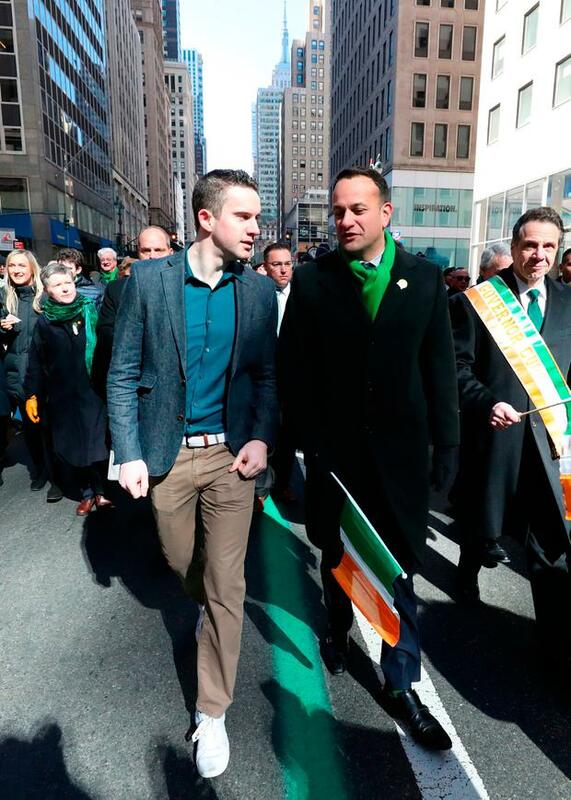 Taoiseach Leo Varadkar and his partner Matt Barrett took part in New York's famous St Patrick's Day parade yesterday, 24 months after a ban preventing gay groups from marching was lifted. Mr Varadkar said he was proud and privileged to take part in the parade in a city with many close ties to Ireland. New York's mayor Bill de Blasio declined to take part in the parade in 2014 because of the exclusion of gay rights groups. The ban caused controversy in recent years and was only lifted in 2016 after much public outcry. Before marching alongside his partner Mr Barrett, a cardiologist based in Chicago, yesterday Mr Varadkar said: "I had a chance to meet the Mayor (Bill de Blasio) earlier and attend Mass, and I'm going to be able to march in the parade now with my partner which is something that is a sign, I think, of change, a sign of great diversity, not just in Ireland, but in the community here as well," he said. Mr Varadkar also shared further details about his meetings with US President Donald Trump last week describing him as "very personable, very engaged" but added he was not "a conventional politician" and tended to move from one topic to another quite quickly. He said Mr Trump was not an expert on Irish affairs but that he had an awareness of what is happening on this side of the Atlantic. "I think he was definitely aware of Irish issues. I think he was certainly aware of issues around the Irish border and the need to avoid a hard border," he said. "He was aware of European affairs in terms of trade, and was also very aware that we have a low tax regime. I wouldn't say he was an expert on Ireland, but he had an awareness of issues relating to Ireland and gave us a lot of time during the day which I think was very welcome." Mr Varadkar batted away suggestions he "made a show of himself" in Washington DC in the controversy about his intervention in a planning dispute involving Donald Trump's golf course in Doonbeg. The Taoiseach said he felt he had clarified the issue sufficiently. It came after he revealed he had been mistaken when he claimed he contacted Clare County Council about a wind farm planning application that Mr Trump was opposed to. Mr Varadkar said he had contacted tourism agency Failte Ireland about Mr Trump's concerns about the impact the wind turbines would have on the view from his Doonbeg course in Co Clare. Mr Varadkar's officials released a copy of the email he sent in 2014, when he was tourism minister, to the boss of Failte asking him if the organisation shared Mr Trump's concerns about the "impact on landscapes and tourism". "I've clarified that I was certainly telling a humorous anecdote and I've clarified it since then and that's the end of it as far as I'm concerned," Mr Varadkar said.